Founded in 1971, NCMGMA has grown to over 1000 members representing more than 500 medical groups from all across North Carolina. 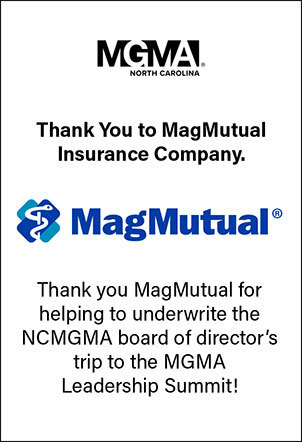 NCMGMA is the leading and most recognized resource for education, networking and advocacy for medical group leaders in North Carolina. NCMGMA maximizes the value and effectiveness of medical group leaders through educational programs, information exchange, networking, advocacy, and professional development opportunities.